This artist’s impression shows the yellow hypergiant star HR 5171. This is a very rare type of star with only a dozen known in our galaxy. Its size is over 1300 times that of our Sun — one of the largest ten stars found so far. Observations with ESO’s Very Large Telescope Interferometer have shown that it is actually a double star, with the companion in contact with the main star. 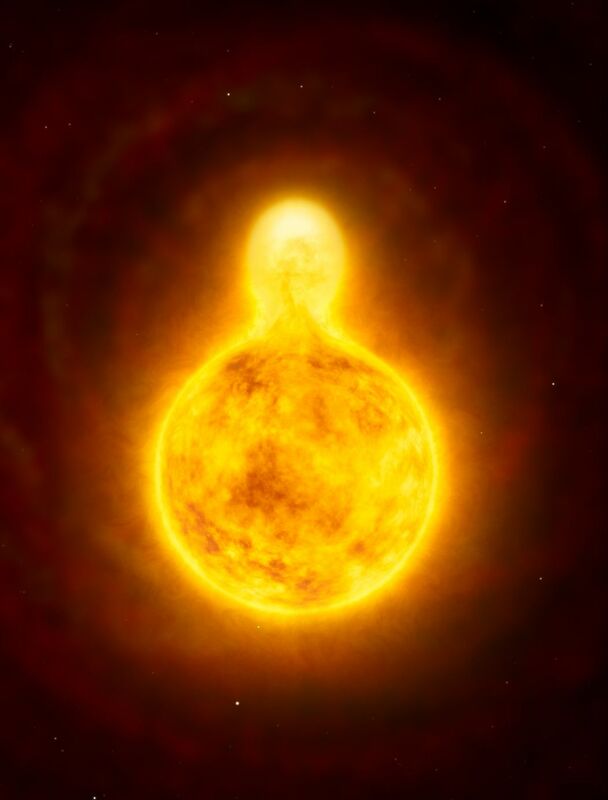 Yellow hypergiants are very rare, with only a dozen or so known in our galaxy, the best-known example being Rho Cassiopeiae. They are among the biggest and brightest stars known and are at a stage of their lives when they are unstable and changing rapidly. Due to this instability, yellow hypergiants also expel material outwards, forming a large, extended atmosphere around the star. Despite its great distance of nearly 12 000 light-years from Earth, the object can just about be seen with the naked eye by the keen-sighted. HR 5171 A has been found to be getting bigger over the last 40 years, cooling as it grows, and its evolution has now been caught in action. Only a few stars are caught in this very brief phase, where they undergo a dramatic change in temperature as they rapidly evolve. By analysing data on the star’s varying brightness, using observations from other observatories, the astronomers confirmed the object to be an eclipsing binary system where the smaller component passes in front and behind the larger one as it orbits. In this case HR 5171 A is orbited by its companion star every 1300 days. 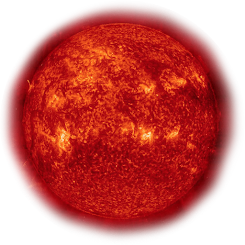 The smaller companion is only slightly hotter than HR 5171 A’s surface temperature of 5000 degrees Celsius. Chesneau concludes “The companion we have found is very significant as it can have an influence on the fate of HR 5171 A, for example, stripping off its outer layers and modifying its evolution.”mThis new discovery highlights the importance of studying these huge and short-lived yellow hypergiants, and could provide a means of understanding the evolutionary processes of massive stars in general.